GR: Nuclear war poses a massive threat to life on Earth. In fact, few analysts believe that anyone would survive a nuclear war. The security achieved by mutually assured destruction is madness. However, when madmen control governments nothing and everything is insane. “The US nuclear forces modernization program has been portrayed to the public as an effort to ensure the reliability and safety of warheads in the US nuclear arsenal, rather than to enhance their military capabilities. In reality, however, that program has implemented revolutionary new technologies that will vastly increase the targeting capability of the US ballistic missile arsenal. This increase in capability is astonishing—boosting the overall killing power of existing US ballistic missile forces by a factor of roughly three—and it creates exactly what one would expect to see, if a nuclear-armed state were planning to have the capacity to fight and win a nuclear war by disarming enemies with a surprise first strike. “Because of improvements in the killing power of US submarine-launched ballistic missiles, those submarines now patrol with more than three times the number of warheads needed to destroy the entire fleet of Russian land-based missiles in their silos. US submarine-based missiles can carry multiple warheads, so hundreds of others, now in storage, could be added to the submarine-based missile force, making it all the more lethal. “The revolutionary increase in the lethality of submarine-borne US nuclear forces comes from a “super-fuze” device that since 2009 has been incorporated into the Navy’s W76-1/Mk4A warhead as part of a decade-long life-extension program. We estimate that all warheads deployed on US ballistic missile submarines now have this fuzing capability. Because the innovations in the super-fuze appear, to the non-technical eye, to be minor, policymakers outside of the US government (and probably inside the government as well) have completely missed its revolutionary impact on military capabilities and its important implications for global security. “Before the invention of this new fuzing mechanism, even the most accurate ballistic missile warheads might not detonate close enough to targets hardened against nuclear attack to destroy them. But the new super-fuze is designed to destroy fixed targets by detonating above and around a target in a much more effective way. Warheads that would otherwise overfly a target and land too far away will now, because of the new fuzing system, detonate above the target. “The result of this fuzing scheme is a significant increase in the probability that a warhead will explode close enough to destroy the target even though the accuracy of the missile-warhead system has itself not improved. 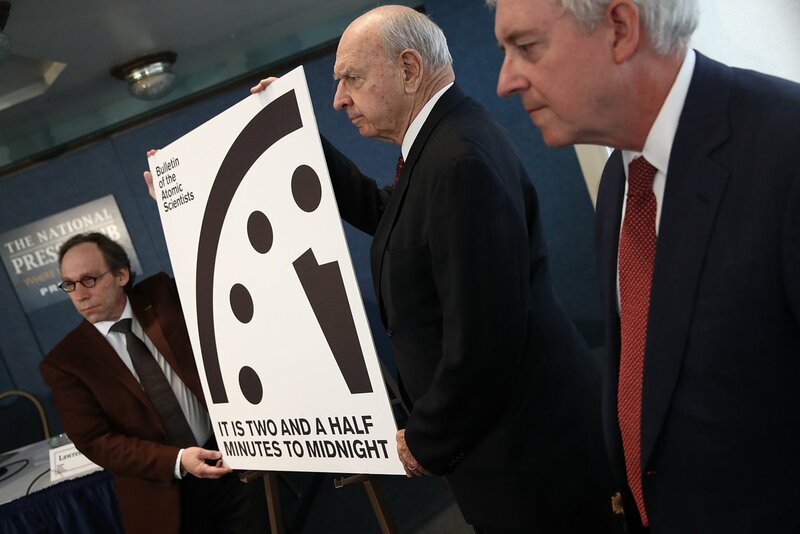 This entry was posted in Nuclear Weapons/Energy and tagged doomsday-clock, fuzing, hard-targets, nuclear-war, US-ballistic-missiles by GarryRogers. Bookmark the permalink.